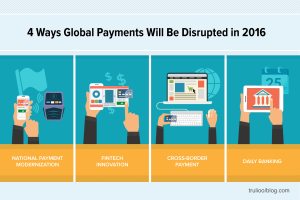 When you hear “disruption in payments,” what comes to mind? Is it paying with your fingerprint instead of a credit card? Is it putting your money into Bitcoin and bypassing the banking system to pay? These are surely “disruptive” innovations in payments but as last night’s Atlanta BayPay Forum demonstrated, there is also lots of disruption going on under the radar, leveraging the same payment rails put into place over 50 years ago. And as we found, just because innovations capitalize on current infrastructure doesn’t mean that they are any less disruptive or exciting than the flashiness of alternative currencies and biometrics. The panel, moderated by Thad Peterson, Senior Analyst at Aite Group and founding member of Atlanta BayPay, included Bluefin’s Chief Commercial Officer, Guido Schulz; Michelangelo R Ho, Head of the FinTech Program at the Atlanta Technology Development Center (ATDC); Shirish Arashanapalli, CEO and Founder of Trendbrew; and Jennifer Hughes, Business Development for Vix Verify. The panel brought an interesting mix of companies together – with Bluefin focusing on payment security solutions with PCI-validated Point-to-Point Encryption (P2PE); ATDC incubating promising Atlanta FinTech startups; Trendbrew merging an innovative shopping platform with payments and rewards; and Vix Verify providing remote authentication of consumers and users for the banking and retail industries. So what did we learn about payments disruption from this diverse group of entrepreneurs? Vix Verify, taking consumer authentication a step further, with an end-to-end green ID solution which uses multi-­factor biometric verification to automate the traditional verification process. Why is this important to payments? Well clearly to prevent payment and banking fraud, but also to more quickly facilitate payments for gaming websites and for money transfers. Trendbrew, developing a proprietary “social trending” platform that brings together influencers, retailers and consumers. Why is this important to payments? Most payment companies (and many retailers) are woefully behind on their social media strategy. Trendbrew capitalizes on social media and influencers to increase participating retailer sales while providing issuers an opportunity to capture the sale with cashback and other offers. Why is this important to payments? Incubators like ATDC are integral to encouraging payment innovation and ensuring the viability and continued growth of our payment system. Take ATDC incubation company Groundfloor, a peer-to-peer micro-lending platform for funding U.S. real estate deals. Investors can earn high rates of interest on short-term secured loans starting with as little as $10. Bluefin, introducing the first PCI-validated P2PE solution in March 2014, to secure POS card payments by encrypting all data in the POS device and only decrypting the data in their offsite HSM – ensuring no clear-text card data resides in the merchant environment. Why is this important to payments? Data breaches have risen exponentially over the past 3 years, with big names like Target and Home Depot suffering breaches, which led to the theft of millions of credit cards because this data was “in the clear” in the merchant system. This type of theft costs retailers and issuers billions each year – while shaking consumer confidence in the U.S. payment system as a whole. One of the most interesting discussion points from the panel was that innovation has primarily happened on the peripheral, while the core, “fundamental” rails to process a payment (merchant to processor to issuer) haven’t dramatically changed. And they probably won’t – unless you want to put your money in Bitcoin. But we are not there yet. One can argue that encryption and consumer authentication have been around for years. So how are those technologies disruptive? The same with aggregated shopping – which is a concept that eBay introduced in 1995 – or with micro-investment platforms. The difference with the companies and technologies at last night’s BayPay Forum is that they have capitalized on previous iterations of “standard” technologies to introduce a new, better, faster or more secure product. The companies last night are proving that you do not need to reinvent the wheel – you can disrupt just by evolving the wheel into something more innovative. As Guido Schulz said, “Bluefin is a 10-year old startup.” That could be considered a bizarre statement for a company that has over 100 employees in 5 offices, including in Ireland. The major point that all of the entrepreneurs on the panel had in common was that at either their current company or at their previous ventures, these entities had gone through periods of transformation – where they started out one way and because of market conditions, foresight or other factors, ended up somewhere completely different. Bluefin was founded in 2007 to provide payment processing to SMB’s but the focus turned primarily toward securing payments in 2014 when they became the first North American company to receive PCI-validated P2PE status – a sure disruptor in payments security. Vix Verify, an Australian based company founded in 2008, has morphed into a global leader in identity verification yet it just opened its first U.S. office in Atlanta 6 months ago. Trendbrew, a mere 6 months in operation but with nearly $400,000 in payments processed under its belt, is in a highly agile stage – exploring new offers, payment partnerships, and retail partnerships. Often, it is not always about how “disruptive” a technology is but how disruptive the company with that technology thinks and behaves. Disruptive companies have the ability to move quickly to respond to market demand but also to recognize they can’t “go it alone.” All of the panelists counted partnerships as very important to their company’s success, providing a distribution channel and word of mouth that is integral to their growth. Georgia is 3rd in the nation, just behind New York and California in FinTech revenue. Georgia FinTech companies have produced more than $83 billion of shareholder value since 1995 and revenues are more than $34 billion annually. Organizations such as the Atlanta BayPay Forum play an important role in bringing FinTech and payments companies together to share thoughts and learn from experiences. You can learn more about the BayPay Forum at www.baypayforum.com.